"The Rich Athenian Lady Was Pregnant"
Maria Liston, Associate Professor and Chair of the Anthropology department, received her BA in Classics from King College in Bristol, Tennessee and her MA in Classics from Indiana University. She then completed a BA and PhD in Anthropology from the University of Tennessee. She pursues research as a skeletal biologist and archaeologist, focusing on the excavation and analysis of human remains and their mortuary contexts. Since 2001 she has worked as the skeletal biologist in the Athenian Agora, the civic and religious center of ancient Athens. In her work there she has recently identified the oldest case of battered child syndrome known from the archaeological record. She also works in Greece with the excavations at Mycenaean Iklaina, and the new excavations in the Sanctuary of Ismenion Apollo in Thebes. 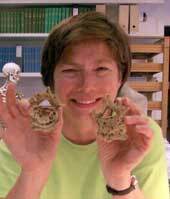 She is currently publishing the skeletons from tombs found at Kavousi, Crete. She also has directed the analysis of the remains of British and colonial soldiers at Fort William Henry, in New York. She involves students in research and overseas study projects whenever possible.